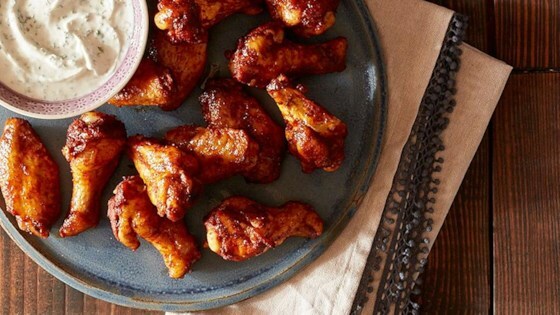 "Ditch the deep fryer in favor of flavor-packed baked chicken wings coated in Moroccan spices and crisped to perfection atop a foil-lined baking sheet from Kelly Senyei of Just a Taste. Dunk the spiced wings in a refreshing herb yogurt dip made with mint, cilantro, lemon juice and honey." Preheat the oven to 400 degrees F. Line a baking sheet with Reynolds Wrap(R) Non-Stick Foil. Add the chicken wings to a large bowl, drizzle them with the vegetable oil then toss until the wings are thoroughly coated. In a small bowl, stir together the paprika, cumin, cinnamon, ginger, cayenne, turmeric, salt and pepper. Sprinkle the wings with the spice mixture, tossing until they are coated. Arrange the wings in a single layer on the baking sheet, spacing them apart so that they aren't touching. Line a baking sheet with Reynolds Wrap® Heavy Duty Foil for quick and easy cleanup every time! This was so good I made it twice. I didn't make any changes to the recipe as I often do the 2nd time I make it, it was that good. Didn't care for the chicken as not much taste. The second time I made this I doubled the spices, because they were so good. Great recipe! Used the recipe with a pork tenderloin, which was grilled to medium rare (150F with meat thermometer). Served with grilled pineapple slices and the yogurt dip. Quick and tasty.